It is known that Brazil has the expertise to drill deeply into the ocean. It has then technology today because it invested in deep drilling science project many years ago. Brazilian newspaper O Estado de Sao Paulo reports today that we will soon be able to make a journey to the center of the earth, or at least, to where it starts. So say also group of scientists writing in Nature magazine. They argue that existing technologies are sufficient to pierce our planet's crust until the bottom layer, the mantle - which represents 68% of Earth's mass and remains unexplored. The goal is to better understand the structure of the Earth, the occurrence of earthquakes and enhance mineral exploration. The scientists propose, in practice, the resumption of the first scientific drilling expedition to the ocean, which occurred 50 years ago, in April 1961, Project Moholo. Although not successful in it goal of traversing the rocky layer that forms the crust, this expedition was able, with the drilled two kilometers from the ground at sea, to develop the technology that now helps to exploit the oil fields in deep seam such as Brazil's pre-salt giant Tupi field. According to Benoit Ildefonse, University of Montpellier II, France, an author of the article with Damon Teagle, University of Southampton, Great Britain, "thanks to oil companies now have the technology to drill the distance required to reach the mantle." The goal now is to surpass the milestone of 2,111m, the most that has been reached so far, and drill the required six kilometers to go through the whole crust in its thinnest point, opening a hole of 40 cm that can stay open for many years. The best point of excavation must have the thinnest crust possible. However, in points with a "high rate of spreading", the crust is still hot, as its formation is recent, which makes drilling very difficult. Thus, according to Ildefonse, they have managed to limit the possible locations to three areas - the coast of Hawaii, Baja California, and Costa Rica, all in the Pacific - where the thickness is the thinnest possible plate and the temperature is sufficiently cold. "With this analysis directly from the results of drilling, we can calibrate our indirect data and know exactly where the line is the crust / mantle, producing a better model of the Earth," says Ricardo Trindade, a professor at the Institute of Astronomy, Geophysics and Atmospheric, University of São Paulo. "It's fair to say that, in many respects, we know more about space than about our own planet." 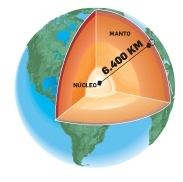 According to Ildefonse, learning more about the mantle may be valuable for the understanding of earthquakes, the convergence of tectonic plates, plaque formation in the ocean and its participation in the chemical cycle of the planet - including the carbon cycle. George Sand, of the Seismological Observatory of Brasilia University (UnB), states that "research will have a huge impact on mineral exploration." He said the drilling could find new deposits, and help in exploration technology. However, even with the advanced oil drilling technology that led to the development of the Chikyu vessel, which will be used for drilling, it still will take at least 10 years of research before work can start. This is because of the technology must be adapted to the enormous pressure and temperature that the equipment will find greater depths. Furthermore, it is necessary to secure funding. "We depend much on political will as the amount of money needed for this project is very large," said Ildefonse, noting that Brazil was part of the countries that financed the project during the 1980s. The payback as we kinow now, was huge. Oil companies can already drill very deep to reach the huge reserves of oil and gas. According to Kazuo Nishimoto, Department of Naval Architecture and Engineering Oceanographic at USP, the deepest drilling of this type was 12km. However, this type of drilling was different from what the Moholo project intends to do. This is because the companies are drilling only in sediment areas that have a lower resistances, and low temperatures, presenting relatively minor technical challenges for drilling equipment. This increased sediment layer is characteristic of coastal regions and some other parts of the ocean topography. Moreover, oil companies typically drill at a depths of about 2km. The regions that the project aims to explore with Moholo are 4 km deep, increasing the pressure on the excavation equipment and generating the need for longer and stronger pipes, which are not yet developed, according to Ildefonse. Therefore, the project seeks specific areas where sediment accumulation is smaller and the crust thinner, punching virtually only the the hard rock that forms the crust. In this layer, the farthest distance we have been able to drill is 2,111m. Given what occurred to the Deepwater Horizon, this sounds like such a good idea! Which is Better Now, Gold or Silver? GE: Tax Avoidance or Tax Evasion? The iPad 2: Duh; Xoom and Playbook Anyone?